Good. 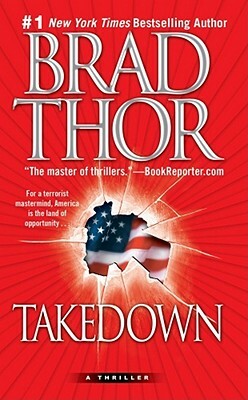 Takedown by Thor, Brad, 2007-05-22. Mass market (rack) paperback. Glued binding. 441 p.
Good++ Pocket Books 2007 Pocket Books 2007 / Ex-library with usual markings o/w VG, light wear to bright view throught cover, tight pages. This author is really one of the best, have found his books to be outstanding. Bought this book in America- on the 4th July- the day the story actuals starts. Believable storyline regarding planned attack in Manhattan.